Each morning, you wake up, brush your teeth, and check your reflection in the mirror. But how much attention are you paying to your tongue? The tongue is a commonly overlooked part of the mouth, but it can hold some significant clues about your dental health. While eating or drinking highly pigmented foods (like coffee) can change the color of your tongue temporarily, an ongoing or lasting change of tongue color is a cause for concern. Don’t worry, though. We’re here to walk you through the ins and outs of keeping your smile beautiful and ensuring a healthy mouth for years to come. What Changes the Color of Your Tongue? The color of your tongue can tell you a lot about your dental health! Some harmless things can make your tongue change hues. These include temporary vitamin deficiencies, drinking alcohol, and eating something with a funny color. 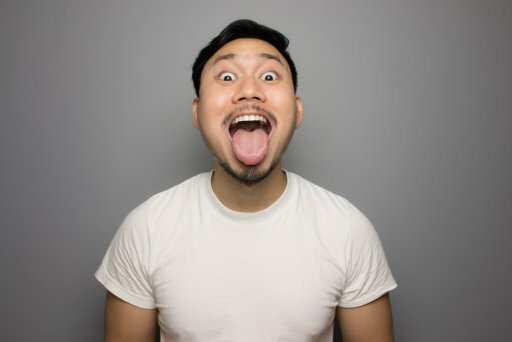 In some cases, though, a change in tongue color can result from a more severe condition, such as poor dental hygiene, an allergic reaction, or irritation. A white tongue is known to the medical world as Leukoplakia. White tongues are often the result of irritation or cigarette smoke. Tongues affected by Leukoplakia have thickened white patches and appear coated. In some cases, this condition can be mistaken for thrush, which is commonly a symptom of diabetes or a compromised immune system. Leukoplakia is most common in smokers. The condition builds up gradually and is not always something people notice immediately. Because of this, visiting a dentist on a routine basis (especially if you’re a smoker) will help you identify Leukoplakia before it gets out of hand. Pale tongues common indicate a nutrient or vitamin deficiency and show up most frequently in people who aren’t getting enough Vitamin A or Vitamin B12. Fortunately, this condition is easily corrected. The first step is to start taking a multivitamin supplement and eating more vitamin-rich foods in your daily diet. Spinach, sweet potatoes, and kale are all great options. After you’ve made the necessary dietary changes, see your dentist to ensure there’s not an underlying problem with your mouth or teeth. Black tongues are the result of a bacteria buildup. This is common in people who smoke heavily, or who don’t brush very frequently. The solution? See your dentist for a thorough cleaning and stop smoking as soon as possible. If you need help quitting, contact the CDC’s quitline here. A yellow tongue is a serious symptom. Yellow tongues can indicate stomach or liver problems. In many cases, yellow tongues become brown or black down the line. Commonly caused by poor dental hygiene or taking a particular medication, yellow tongues can worsen quickly and require immediate dental attention. It’s common for people to pay more attention to their teeth than they do their tongues, but the fact is that the tongue is a fantastic indicator of overall oral health. If you’ve noticed some discoloration on your tongue, the first step is to visit our team of dental professionals. We’ll evaluate your tongue, teeth, and smile to make sure your oral health is where it needs to be. Specializing in preventative dentistry, we’re here to help you keep your smile beautiful for years to come.